Hanoi (VNA) - A regulation recently issued by the Hanoi People’s Committee requires basements be part of new construction projects in the inner city. 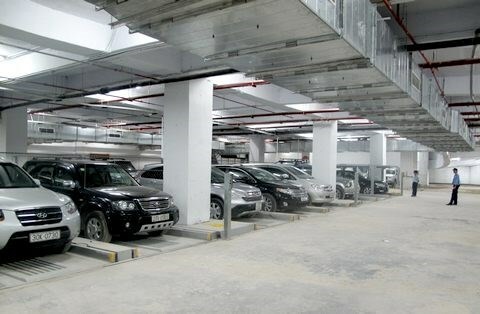 The severe shortage of parking space in the capital is behind the regulation, Hanoi Moi (New Hanoi) newspaper reported. Some 590 parking lots with total area of 38.9ha are currently in use in the central areas of the city, meeting only 8-10 percent of parking demand in these areas, according to the city’s statistics. Most of the parking lots are filled beyond capacity. Due to limited public land, public parking lots throughout the city only serve 66 percent of the city’s total parking demand, precipitating the need for new constructions to have parking basements. The regulation provides specific guidance on the size of the basements. It applies to constructions that are going to get built within the area from Ring Road 2 to the city centre, within the area from Ring Road 2 to Ring Road 4, as well as in satellite and eco-urban areas. Per the regulation, all types of housing, administrative constructions, and urban service constructions such as office buildings, hotels, trade centres, hospitals, schools, and sports and recreation centres will have to provide basements for motorbike parking. Meanwhile, some constructions will not be allowed to provide car parking, including centres for the elderly and people with disabilities, hospitals, boarding school dorms, and schools from nursery and kindergarten to high school and vocational school. The basements should be not more than five levels, while their area should be equal to the construction at minimum, and should not cross the construction boundary. This is not the first time building basements has been required, Tien Phong (Vanguard) reported. In April last year, the city’s Department of Architecture and Planning issued an announcement requesting all high rise buildings have at least three levels of basements. It was then withdrawn after an objection from the National Real Estate Association (VNREA), which argued that such a requirement was contrary to pre-existing construction regulations.